Handcrafted by Harrari Harps in Israel, Levite made, harp makers for the Temple Institute. Beautiful cherry wood with the Aleph-Bet (Hebrew Alphabet) engraved by each string. Includes case. 2800.00 or obo. Located in Concord, NC. Purchased from Bette Roth a few years ago. Lyon and Healy Chicago 40 for sale. Mahogany. New in 2012. Great condition. Restrung and regulated by Ivan Gardner, June 2016. $9,200 Dust cover included. Padded travel cover in excellent condition available for purchase. The harpist is "moving up" from this student harp to a larger harp. FOR SALE: Gorgeous 36 string Thormahlen Serenade with a full set of Camac sharping levers and gut strings. The semi staved back sound box is constructed of Okume, a premium laminated hardwood with a solid rock maple pillar and a 13-ply laminated maple neck. The color is Chestnut. The K & K pickup system has been installed in the harp by the harp builder. The harp comes with a padded case, a tuning wrench, and a spare set of gut strings. 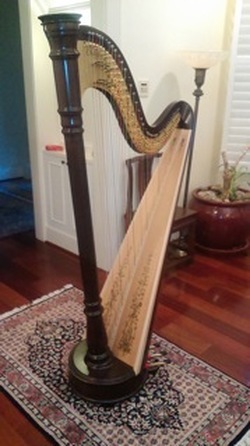 The harp is 6 years old and is in excellent condition. I am asking $3,395.00. I actually still have the shipping box. However, I would prefer not to ship it, but would be glad to meet half way within a 100 mile radius from North Augusta, SC.